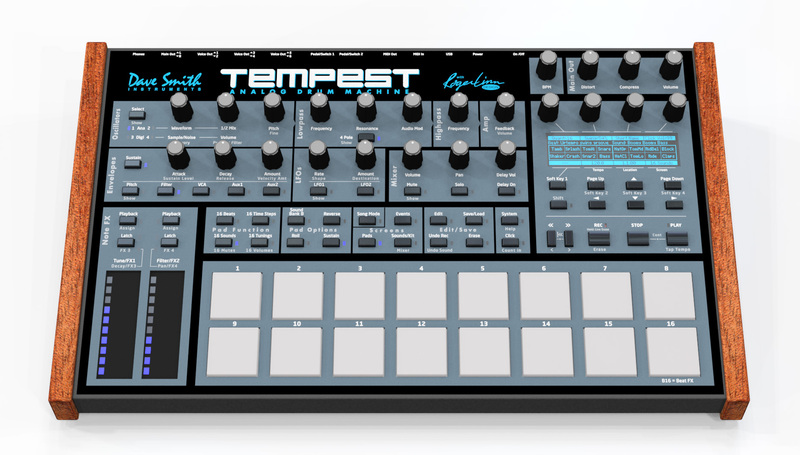 The Tempest will actually be the first of two new drum machines this year, the fruits of the Linn-Smith collaboration. That collaboration started four years ago, as the Dave Smith booth at NAMM teased a concept they called the BoomChik. A non-functional prototype followed a year later, but the project stalled. Dave Smith called for a reboot, and the result will be not one but two drum machines. One will be released by Dave Smith Instruments, and another by Roger Linn Design. The designers each called the shots on the instrument that will bear their name, but they also worked on the other’s creation – a bit like musicians trading remixes. Six analog voices, each with two analog oscillators and two digital oscillators provide deep, rich sound capabilities. Dave’s lowpass filter, a new highpass filter, analog VCA (voltage-controlled amplifier) with feedback, five envelopes, two LFOs, various analog modulation routings. In addition to percussion, you can tune sounds and play scales from the pads, or connect a MIDI keyboard and use it as a 6-voice analog keyboard synth. There’s a small display – 256×64 OLED – but onboard controls are designed for real-time music making (a topic Roger covered with me in more detail, along with his philosophy for how to make drum machines instruments). 2×8 pads, each pressure- and velocity-sensing. Roll function, which doubles as “stutter” when a beat is assigned to a pad. Two touch sliders, each with pressure sensitivity, for more real-time control. Pure analog signal path, but without skimping on effects – stereo analog compressor and distortion, beat-synced delay that actually uses note effects, and beat-synced stutter. In short, it looks like the sound and fun-to-play aspects have been merged into something that I think will have immediate appeal. My prediction is, a lot of folks will be working on how they can set aside two grand. I’ve spoken extensively to Dave and Roger, and will post that separately, because even if you won’t get one of these, seeing into their minds is a great treat.